B. Traven was — and is — my favorite fiction writer. 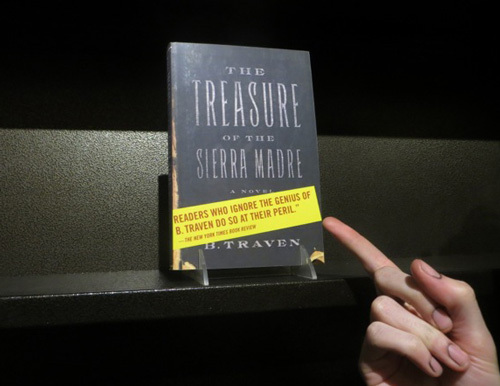 If you’ve seen the Humphrey Bogart film The Treasure of the Sierra Madre, then you might know that the film is based on the Traven novel of the same name. Traven would not have wanted you to know anything about his life, however. He gave a wide berth to interviews, journalists, prizes, and publicity of any sort. Such a wide berth, in fact, that he makes Thomas Pynchon seem like a David Letterman regular. There are quite a few theories about Traven’s identity. One theory is that Traven was the illegitimate son of the German Kaiser. Another theory is that he was Jack London, who faked his death and became Traven. Given that he, like London, wrote about down-and-outers in remote locations, this theory at least makes literary sense, which is more than I can say for the theory that he was the American writer Ambrose Bierce, who disappeared in Mexico in 1913. Traven died in 1969, and if he were Bierce, he would have been 126 years old at the time of his death. In all probability, Traven was the German anarchist writer Ret Marut, who, being pursued by the Kaiser’s secret police, fled to Mexico around 1925 and adopted a new name, lest he be extradited to Germany. To consolidate his camouflage, he engaged in a number of manual jobs — cotton picker, oilman, miner, etc — which gave him an excellent window on his subsequent subject matter. What of Traven’s books? I’m not easily moved by fiction, but I’ve been powerfully moved by The Bridge in the Jungle every time I’ve read it. This novel concerns the disappearance of a young Indian boy and a small village’s efforts to find him. I also recommend the novella Macario, which describes an elderly Indian man’s encounter with Death right after he’s obtained his life’s wish — a roast turkey. And if you want a reading experience that out-Kafka’s Kafka, then you should procure a copy of the doubtless autobiographical novel The Death Ship, a tale of a sailor who has lost his identity papers and who signs on a “death ship” — i.e., a ship destined to be sunk at sea so that the owners can claim the insurance money. Or you could read The Treasure of the Sierra Madre, which, believe or not, is a lot better than the movie.